(2-15-13) New Millennium Railings auto-drawn with StairMaster! Multi-floor, Automatic Stair Railings! Picket-Railing sample., Glass (w/top & bottom rail) Railing sample., Glass (w/Clips) Railing sample., Mesh-Railing sample1., Mesh-Railing sample2., Mesh-Railing sample3. Here's a Sneak-Peek video of the updated StairMaster using Sloped-Railing-Designr to automatically add the railings! That's 1 master elevation drawing (includes railings and plan-views of each floor). 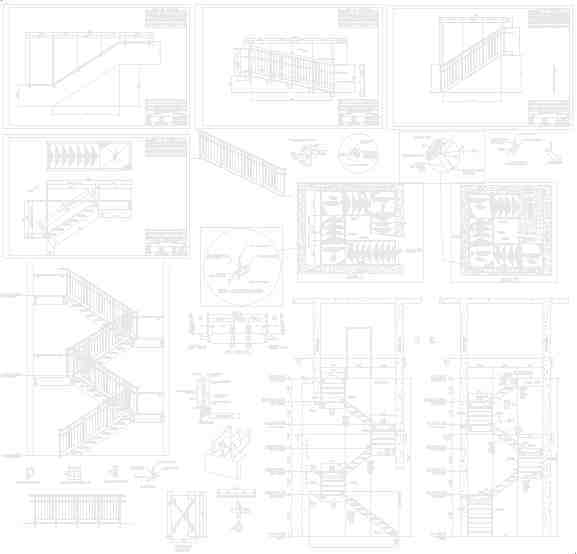 StairMaster draws the Erection Elevation & Plan-views of stairs systems, including Elevation Shop-Drawings, and B.O.M. 'S (Bill-Of-Materials). Many stringer-to-landing connections to choose from. Designs most common types of stair applications quick & easy! Auto-modes and save-configuration features, also complete Help-Systems too! Grating or pan-concrete systems on-the-fly. A must have for multi-floor stairwell systems!